Inspired by the Spanish Dancer sea slug, this design is a mitered, bottom up shawl with a bottom ruffle. Like its namesake, this shawl's bottom ruffle is reminiscent of the beautiful, swirling skirts of Spanish dancers. The knitting is easy, with decreases only on alternate rows and everything knit in soothing garter stitch. The bottom ruffle creates the sense of a fitted shawl with swirling ruffles to give it weight and shape, and the hand-dyed yarn gives depth and color. 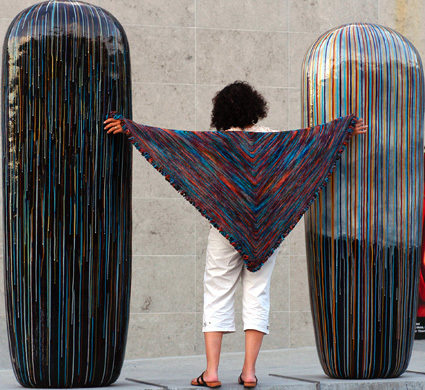 The shawl is unblocked, enhancing its body-hugging shape and making it easy care. This shawl is worked in one piece from the outer most edge to the center, using a provisional cast-on. The bottom edge stitches are then picked up to work the ruffle, while stitches are picked up along the top edge from the garter ridges to form an applied I-cord edging. This shawl is cast on along the outer edges, and worked into the center of the long upper edge. The Materials section above lists a 60-inch circular needle, as this will be required to hold the large number of sts which will result when working the ruffle at the end. However, when working the shawl, you may find it easier to use progressively shorter needles as the shawl progresses, finishing with a 16-inch needle. A Russian join is recommended for joining ends when beginning each new skein of yarn. Instructions for the Russian join can be found here. Instructions for the Provisional Cast On can be found here. S2KP: Slip next 2 sts as if to knit them together, knit next stitch, pass slipped stitches, together, over stitch just knit. This forms a centered double decrease. Place slip knot on left needle. Insert right needle into loop, wrap yarn and draw through as if to knit but do not remove slip knot from needle. Place new stitch onto left needle. *Insert right needle into last stitch made on left needle. Wrap yarn and draw through as if to knit but do not remove stitch from left needle. Place new stitch on left needle. Repeat from * for knitted cast-on. Next Row: Using a double-pointed needle, k2, k2tog. (Last I-Cord st has been worked together with first picked-up st on needle.) Slip 3 sts just worked back to circular needle and bring yarn around back of work, ready to begin working the next row. Repeat this row until all picked-up sts have been worked. Using circular needle and Provisional Cast On method, CO 401 sts. Do not join; shawl is worked back and forth in rows. Row 1: K200, place marker, k1, place marker, k200. Row 2: K1, ssk, k to 2 sts before first marker, k2tog, k1, ssk, k to last 3 sts, k2tog, k1. Row 3: K all sts. Repeat Rows 2 and 3 98 times more, removing markers when working last row. 9 sts remain. Next Row: K1, ssk, S2KP, k2tog, k1. Next Row: K1, S2KP, k1. Last Row: S2KP. Break yarn; place last st on hold on safety pin. Using long circular needle, pick up and k 1 st in edge of each garter ridge along long edge of shawl, knitting held st at center of long edge. Approx. 101 sts on needle. Using US #8/5mm double-point needle, work Applied I-Cord (see Pattern Notes, above). Do not break yarn; place remaining 3 sts on long circular needle. Remove waste yarn from CO edge and place all sts on long circular needle with sts from I-Cord edging. K all sts, then pick up and k 3 sts along CO edge of I-Cord. 407 sts. Row 1: [Kfb] to end. Row 2: K all sts. Repeat these 2 rows once, then repeat Row 1 once more. 3256 sts. Using US #8/5mm needle, loosely BO all sts. Shawl may be blocked if desired, but it is not necessary; the body and drape of the unblocked fabric is wonderful! Sandi Luck, aka, kiyowara, and co-owner of Purlescence Yarns, has a pack-rat mind for technical knitting and other fiber trivia, and is frequently seen staring into space while new designs catch her right between the eyes. 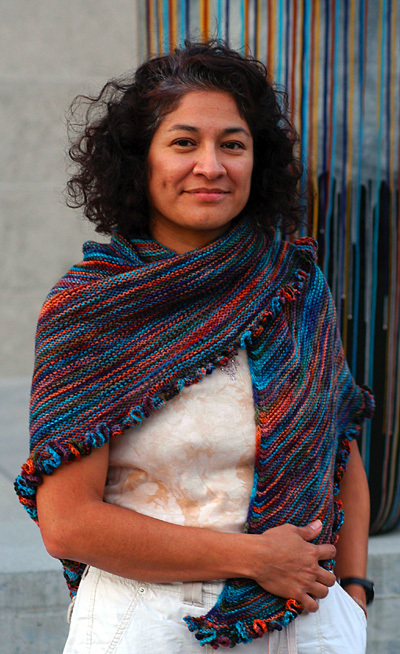 You can find her blissfully knitting in her studio in San Jose, CA.